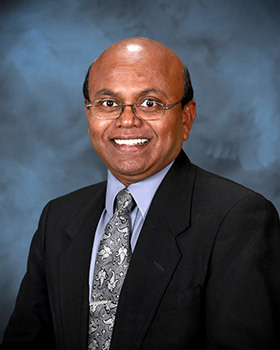 In 1993, Parans Paranthaman, Ph.D., arrived at Oak Ridge National Laboratory (ORNL) to begin postdoctoral research through the Oak Ridge Institute for Science and Education (ORISE). Now, he arrives at the lab daily to fulfill his duties as a Distinguished Corporate Fellow and a group leader of materials chemistry in the Chemical Sciences Division. Oak Ridge National Laboratory group leader Parans Paranthaman, Ph.D., has a passion for supporting the next generation of scientists. As a mentor for students in various Oak Ridge Institute for Science and Education research programs, he shares his knowledge and experience. Crediting positive mentors for his successful career, Paranthaman feels it is his turn to take on such a role. As a result, he regularly hosts students and faculty of various academic levels through ORISE research opportunities. Paranthaman’s research focuses on the design, synthesis and fabrication of new materials and their translation into novel energy technologies. Examples include superconductor wires, electrodes for batteries, flexible thin film solar cells, lithium extraction from geothermal brine and additive manufacturing of magnets. Paranthaman considers the ability to positively influence and motivate students the most rewarding aspect of his job. Every student who has researched under his wing has graduated from college, and more than 60 percent of those students have pursued graduate degrees. His influence often extends beyond the mentees. After spending a summer alongside Paranthaman, high school chemistry teacher James Davis introduced research related to synthesizing nanoparticles of various oxides in his classroom in North Carolina. Since then, Davis’ students have participated in research competitions and won a regional state fair. In 2017, Paranthaman was named a Corporate Fellow for his contributions to his field and to future researchers.